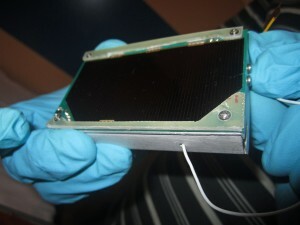 The Peruvian CubeSat PUCP-SAT-1 (145.840 MHz AX.25 FM) was carried by the microsatellite UNISAT-5 which was launched on a Dnepr on November 21, 2013. 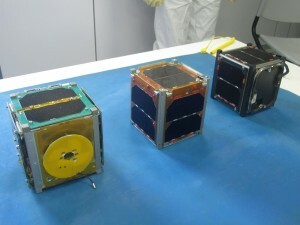 When in orbit UNISAT-5 deployed PUCP-SAT-1 and Neilsao Vilchez reports PUCP-SAT-1 has in turn deployed an even smaller satellite POCKET-PUCP. 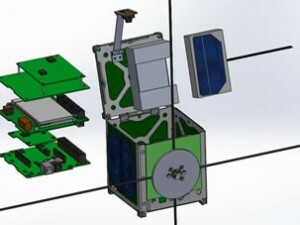 The femtosatellite POCKET-PUCP measures just 8.35 by 4.95 by 1.55 cm and has a 10 mW 12 wpm CW (On-Off-Keying OOK) beacon on 437.200 MHz. The team at the Pontificia Universidad Católica del Perú would welcome any reception reports. 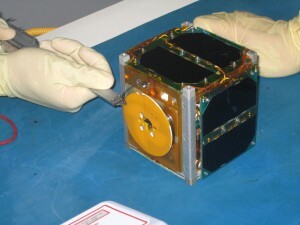 On Wednesday December 4 we detected our satellite PUCP-SAT-1 (launched from Dnepr RS-20/UNISAT-5). Which are very close to each other and we can not resolve which one it is. We got our packet beacon at 145.840 MHz with packets stays 20 seconds, so, it is undoubtedly our beacon, we know that PUCP-SAT-1 is alive, healthy, it has been recharging its batteries okay. On Friday, December 6, as planned, the POCKET-PUCP (femtosatellite) was released around 0800 UT, we are looking for its 437.200 MHz transmission at 12 wpm.